Who should not take Cytogam Vial? 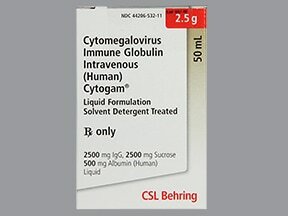 This medication is used to prevent a certain serious viral infection (cytomegalovirus-CMV) in persons having an organ transplant (kidney, heart, liver, lung, pancreas). During the transplant process, the body's defense system (immune system) is weakened to prevent the body from attacking (rejecting) the new organ. A weakened immune system increases the risk of a serious, possibly fatal infection with CMV. This medication is made from healthy human blood that has a high level of certain defensive substances (antibodies) that help fight CMV. This medication is often used with the antiviral medication ganciclovir. This medication is given by slow infusion into a vein as directed by your doctor. The first dose is usually given within 3 days of the transplant, followed by more doses every 2 to 4 weeks or as directed by your doctor. The dosage and frequency depends on your medical condition, weight, and response to treatment. What conditions does Cytogam Vial treat? Flushing, chills, muscle cramps, back/joint pain, fever, nausea/vomiting may occur. Tell your doctor or health care professional right away if any of these effects occur, persist, or worsen. Pain, redness, and swelling at the injection site may also occur. If these effects continue or become bothersome, tell your doctor. Tell your doctor if you experience any of these unlikely but serious side effects: easy bleeding/bruising, fast/irregular heartbeat, unusual tiredness, signs of kidney problems (such as change in the amount of urine, pink/bloody/frothy urine), sudden weight gain. Rarely, this product may contain substances that could cause infections because it is made from human blood. Discuss the risks and benefits with your doctor. Tell your doctor right away if you develop any signs of infection such as persistent sore throat/fever, yellowing eyes/skin, or dark urine. Treatment with this medication may rarely cause an inflammation of the brain (aseptic meningitis syndrome) several hours to 2 days after your treatment. Get medical help right away if you develop severe headache, stiff neck, drowsiness, high fever, sensitivity to light, eye pain, or severe nausea/vomiting. Lung problems may occur 1 to 6 hours after your treatment. You will be monitored closely for any lung problems after your treatment. List Cytogam Vial side effects by likelihood and severity. Before receiving this medication, tell your doctor or pharmacist if you are allergic to it; or to other immunoglobulin products (such as IgG); or if you have any other allergies. This product may contain inactive ingredients, which can cause allergic reactions or other problems. Talk to your pharmacist for more details. Before using this medication, tell your doctor or pharmacist your medical history, especially of: certain immune system problems (immunoglobulin A deficiency, monoclonal gammopathies), diabetes, high blood pressure, high blood fats (triglycerides), migraines, current blood infection (sepsis), kidney disease, severe loss of body fluids (dehydration). What should I know regarding pregnancy, nursing and administering Cytogam Vial to children or the elderly? Some products that may interact with this drug include: drugs that may harm the kidney (e.g., aminoglycosides such as gentamicin), "water pills" (diuretics such as furosemide). Does Cytogam Vial interact with other medications? Laboratory and/or medical tests (e.g., kidney function test, urine volume) should be performed periodically to monitor your progress or check for side effects. Consult your doctor for more details. Store in the refrigerator between 36-46 degrees F (2-8 degrees C). Use opened vials within 6 hours. Discard any unused portion. Keep all medications away from children and pets. Are you taking Cytogam Vial? Are you considering switching to Cytogam Vial? How long have you been taking Cytogam Vial?